Developed specifically for Kunstverein Braunschweig, Tim Etchells’ work Together Apart encompasses all fifteen rooms of the Villa Salve Hospes. In this expansive sound installation, language, not a physical object, is the focus. Multiple loudspeakers project the voice of an individual who gives visitors instructions; these consist of English forms of speech that metaphorically refer to different parts of the body: “Go with your heart,” “Keep your eyes peeled,” and “Keep your nose out of it.” While viewers attempt to mentally decipher, or perhaps physically implement , the mantra-like phrases of these interwoven sounds, the words take on a degree of urgency due to their presence in the space. As a listener, one inevitably has a sense of being personally addressed, and one finds oneself drawn into the situation. Together Apart sparks associations that accompany or even guide visitors on a social, architectural, physical, and mental level as they make their way through the exhibition spaces. The sound collage repeatedly gives rise to perplexing moments, when scraps of text seem to alternate between their literal and metaphorical meanings or when these meaning seem to break down into syllables of sound through repetition. 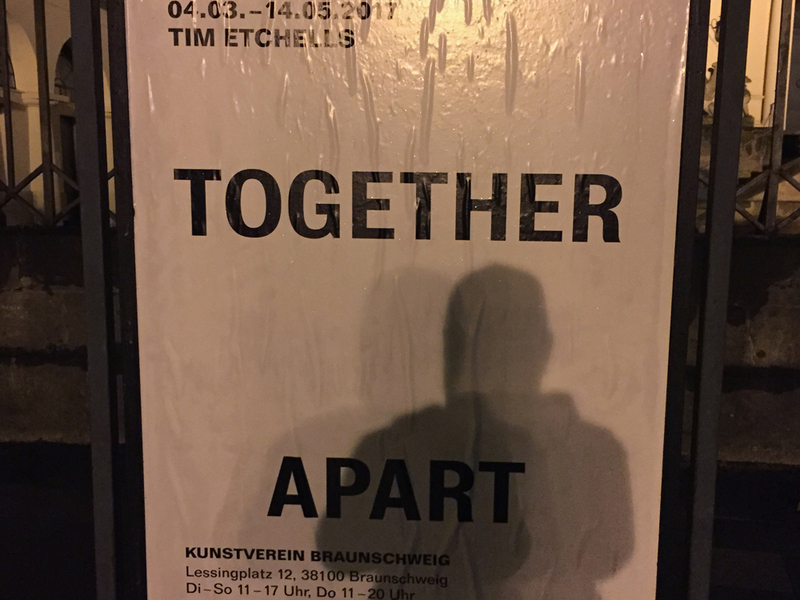 Together Apart is at Kunstverein Braunschweig from 4 March – 14 May, 2017.